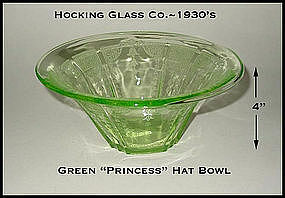 Hocking Glass Royal Ruby Footed Creamer ~ Mint! 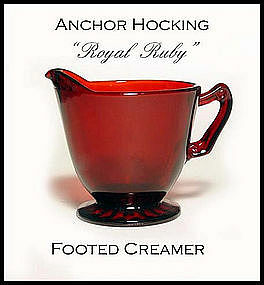 Royal Ruby footed creamer made by The Hocking Glass Co. in the late 1930's. Excellent unused condition! 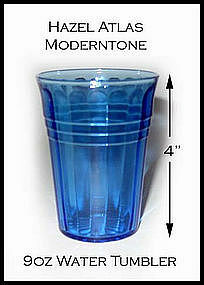 Cobalt Moderntone 9oz water tumbler in excellent condition. Please specify the amount of tumblers you want. Some collectors call this pattern Wedding Band. 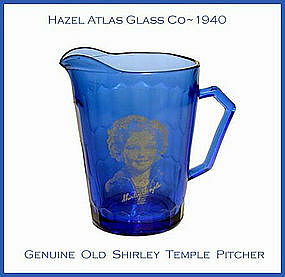 Genuine 1940 cobalt Shirley Temple child's milk pitcher. 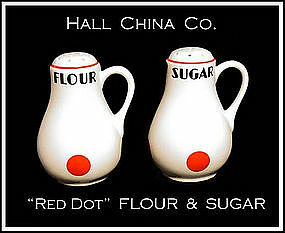 Part of a 3 pc set that included a cereal bowl, a mug, and this pitcher. Photo is silk screened on glass. Super! This pitcher is guaranteed old! 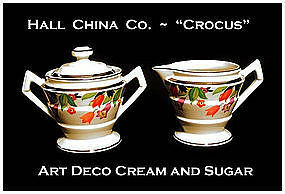 This art deco style cream and sugar bowl was made by the Hall China Co and the pattern is called Crocus. This set is a hard set to find. 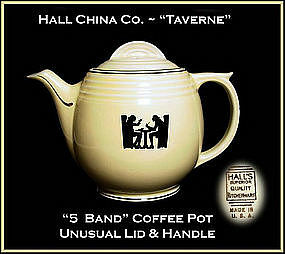 This Hall Taverne 5 Band Coffee Pot is in excellent condition. This one has a harder to find style lid and has a "thumb tab" handle on it. Most of these pots have a plain handle and a "half moon" lid. It has the HSQK mark on the bottom. 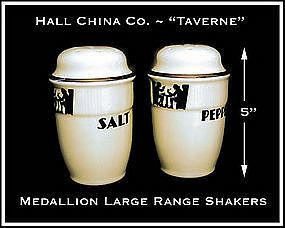 These are the large Medallion range shakers in the Taverne pattern made by the Hall China Co. for Cook Coffee. They are in excellent condition! 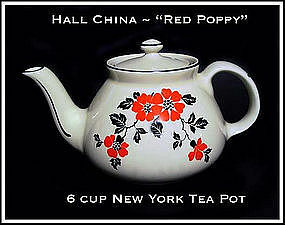 Red Poppy 6 cup New York style tea pot made by the Hall China Co. Excellent condition! 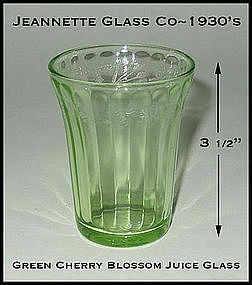 Green Cherry Blossom flat juice tumbler made in the 1930's by Jeannette Glass Co.~Excellent condition! 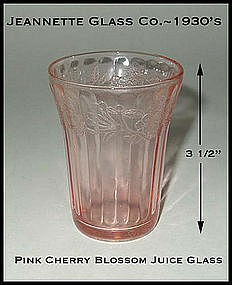 Pink Cherry Blossom flat juice tumbler made in the 1930's by Jeannette Glass Co.~Excellent condition! These are the beautiful pink that all collectors search for, not the orangish pink. We have 3 tumblers available @ $22.00 each. 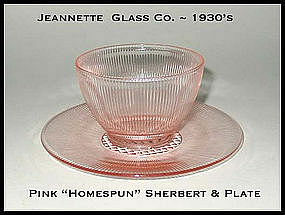 These pink Homespun sherberts have always been hard to find. These 6 sets came in their original box, but it was falling apart and we had to discard it. These were never used. 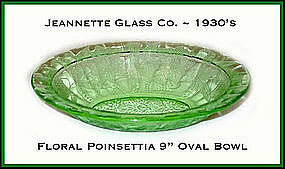 Beautiful green Floral Poinsettia 9" oval bowl in excellent condition. Very handy serving bowl. 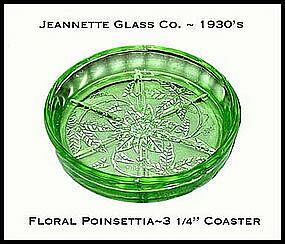 Round Floral Poinsettia green drink coaster in excellent condition. 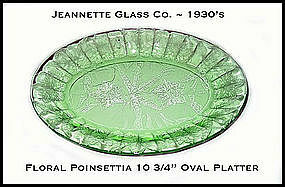 Green Floral Poinsettia 10 3/4" oval platter. No chips or scratches. 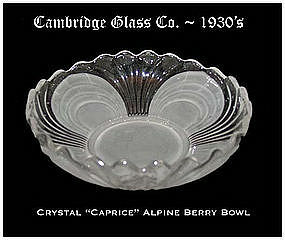 These Cambridge Caprice Alpine bowls are in excellent condition. 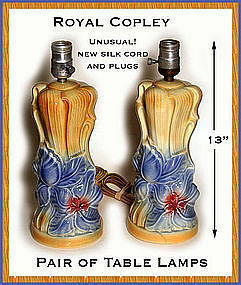 The company did a special treatment on these to enhance the pattern. 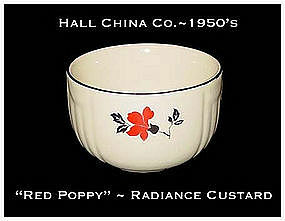 Red Poppy Sunshine Radiance custard cup in excellent condition. Please specify desired amount when ordering.